Having trouble sleeping or worried that you are getting fatter every day? Have you considered that eating late at night is bad for your diet? If so, you must read this. How do you lose weight simply by paying attention to the time you eat your meals with smart meal timing adjusted to match the circadian rhythms of your biological clock? This is one question you should be asking yourself before eating late or skipping a meal, on the intersection between losing weight and eating healthy. Why eating late make you fat? We've all been told that eating late at night leads to unwanted weight gain and while sleeping you are unable to burn off these unwanted calories. You may be thinking that this might be the only reason behind your weight gaining worries. Although eating during the late hours of the day is generally not a good idea, especially when you are on a diet; however there are times when avoiding eating late is not practical. In this case you want to eat a healthy snack even at midnight just enough to hold you till breakfast the next day. Eating late at night and not being able to burn off excess calories is not the only thing you have to worry about when trying to maintain weight. Here are 4 reason why this is not the case. The nervous system is an elaborate network connecting the brain to the body. It can be broken down into many parts responsible for separate functions. On of which is known as the Autonomic Nervous System (ANS) responsible helping the body react to stress and rest. The ANS is broken into two parts called the Parasympathetic division which aids in functions associated with rest, and the Sympathetic division aiding promoting increased activity. As the body prepares for rest during the later hours, the Parasympathetic division kicks in and takes precedence of the Sympathetic division causing you to relax and the metabolism to slow down. This is why eating at night is dangerous for those on a diet. During this time the metabolism is being inhibited by the bodies resting facilities causing less energy to be burned off after a meal, making it easy for that energy to be stored as fat. The metabolism can be broken down into various parts. Two of which are the basal metabolism, also known as the resting metabolism, and that associated with activity. When you exercise your metabolism is excited resulting in more calories to be burned than normally. Eating has a similar effect. The foods you eat cause the body to consume energy. As well as chewing and swallow, the body has to adjust to changes such as different in temperature between food and the body. It also has to react to flavor and taste. One example of which is when eating spicy foods. It is not uncommon to begin sweating after eating something spicy. Even this burns energy. This is an example of what is known as Diet Induced Thermogenesis (DIT).You may be wondering, what is the best time to eat in order to take advantage of this facet of the metabolism. It turns out that DIT is the greatest in the morning and declines toward late at night. In general, energy consumed through DIT can reach as much as 10 percent. This is a lot considering the amount of effort you put in. When eating late at night energy consumption through DIT is at minimum leaving extra calories to be directed to fat stores. The adrenal cortex hormone (glucocorticoid) is involved in breaking down sugars, protein, and carbohydrates. It allows the body to consume energy increasing blood sugar levels. Glucocorticoid levels are at their highest during the morning hours and begin to drop gradually towards the night. 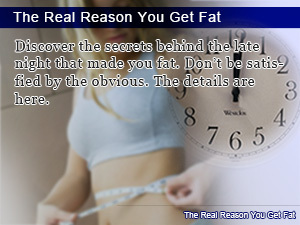 For this reason, food eaten late in the night is almost always stored as fat. With low glucocorticoid levels it is difficult to convert food into energy and easy for food to reach the fat stores, making it easy to gain weight. Every now and then recent advancement in science make there way into our lives. Recently, the existence of the protein BMAL1 and its relation to fat storage has been made apparent. We now understand that BMAL1 is a part of the biological clock responsible for increases enzymes that promote fat storage in the body. The amount of BMAL1 in the body depends on time, hence the biological clock. After 5 PM, about the time most people get of work, BMAL1 levels are at their lowest; while between 10 PM and 2 AM, BMAL1 levels are considered high. Therefore, for those worried about getting fat, try to avoid eating between the hours when BMAL1 levels are high. The number of calories may be the same, but depending on the hour consumed fat storage may differ greatly. You may be thinking the same thing, if eating late and getting fat is caused by sleeping after eating, why don't you just stay up. Well, it turns out it doesn't work that way. It is harder to burn of energy late at night than during the day. When tired the metabolism is inhibited, making use of fat stores as an output for consumption. This is why it is healthier to eat early than late at night. It makes more sense considering BMAL1 levels are lowest in the morning, making it harder to get fat. Conversely, it would be advised that one eat early as well. Not only does eating late make it easy to get fat, it is not considered healthy. Among other things, the quality of sleep you get is not that good. Indigestion could also be a problem impairing nutrient extraction from food. Since it takes the body around 3 hours digest food, it's a healthy choice to eat at least 3 hours before going to sleep. With that said, you are more likely to burn of calories and less likely to store fat, while getting better sleep. 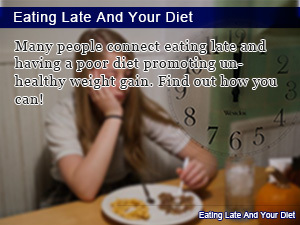 Many people connect eating late and having a poor diet promoting unhealthy weight gain. Find out how you can! Discover the secrets behind the late night that made you fat. Don’t be satisfied by the obvious. The details are here. 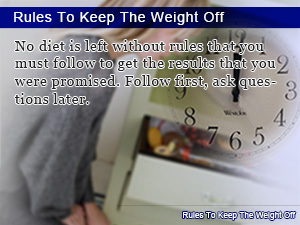 No diet is left without rules that you must follow to get the results that you were promised. Follow first, ask questions later.